You work hard to stay in pace with your busy schedule by never hesitating to tackle the roads of Avon, Indianapolis, and Plainfield. And when it comes to your ride, you need to be armed with compelling performance, engaging technology, and plenty of safety, to boot. By choosing either the 2018 Toyota Camry or the 2018 Hyundai Sonata, you’ll easily dominate anything you encounter on the highway. But to truly dominate every curve, only one of these sedans will deliver on all your demands. Let’s take a look at which of these cars crosses the finish line first by checking out this Toyota Camry vs. Hyundai Sonata vehicle comparison created by Andy Mohr Toyota. Before long, you’ll know exactly which sedan will help you fully enjoy every adventure. No matter what you path to work entails, it’s essential to arm yourself with an engine that won’t hesitate to pounce on the asphalt. Luckily, the 2018 Toyota Camry answers your performance prayers with its standard 2.5-liter engine that pumps out 203 horsepower and 184 lb-ft of torque. And by pairing all that spinetingling force with a seamless 8-speed automatic transmission, this agile sedan will serve up the ideal dose of strength with the slightest press of the accelerator. That way, you won’t be left with a moment of lag from your motor. On the other hand, the 2018 Hyundai Sonata features a standard 2.4-liter turbine that produces 185 horsepower and 178 lb-ft of torque, which falls short of what its Toyota competitor has to offer. In addition, because this sedan only equips you with a 6-speed automatic transmission, you may not find your drive as capable as what you’d have at the helm of the Toyota Camry. Above all else, you’ve got to make sure that your vehicle is adorned with lots of high-tech gadgets. 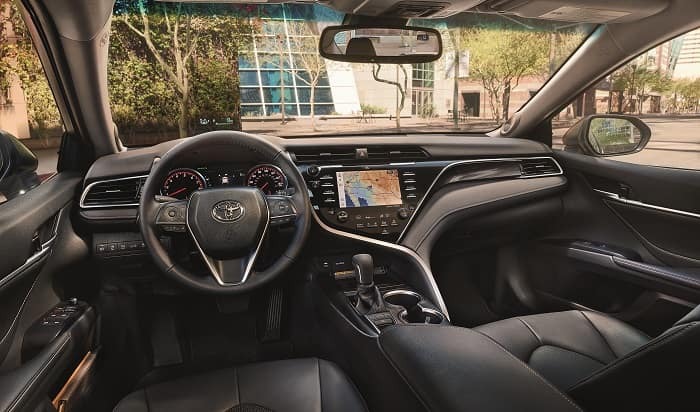 And inside the 2018 Toyota Camry, you’ll easily connect to the Entune™ infotainment system that operates using a responsive 7-inch touchscreen. Plus, this setup comes with tools like the Connected Navigation Scout® GPS Link App, which guides you to your destination with turn-by-turn directions. Thanks to this intelligent feature, you won’t get lost on your way to an important event. And while the 2018 Hyundai Sonata also presents a 7-inch display, it doesn’t include any type of standard navigation amenities, like what you’ll find inside its Toyota counterpart. Unfortunately, that means that your ride inside the Hyundai Sonata could be a little less convenient than you prefer. You want an automobile that’s decked out with all the necessary conveniences, including peace-of-mind. That’s why the 2018 Toyota Camry protects you and your loved ones with the standard Toyota Safety Sense™ P system. Alternatively, the 2018 Hyundai Sonata provides a couple driver assistance features, but it doesn’t come with standard technologies like Lane Departure Warning or Automatic Hight Beams. Without these devices, you may not be able to fully monitor all your surroundings. 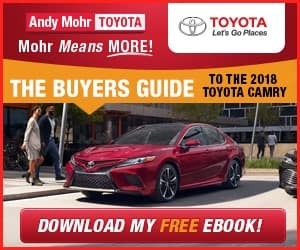 At Andy Mohr Toyota, we want to help you get back on the roads of Avon, Indianapolis, and Plainfield with robust power, innovative technologies, and industry-leading safety. So, if you want a thrilling ride, look no further than the 2018 Toyota Camry. To explore more about what this dynamic sedan has to offer, feel free to stop by our showroom or schedule your test drive today!